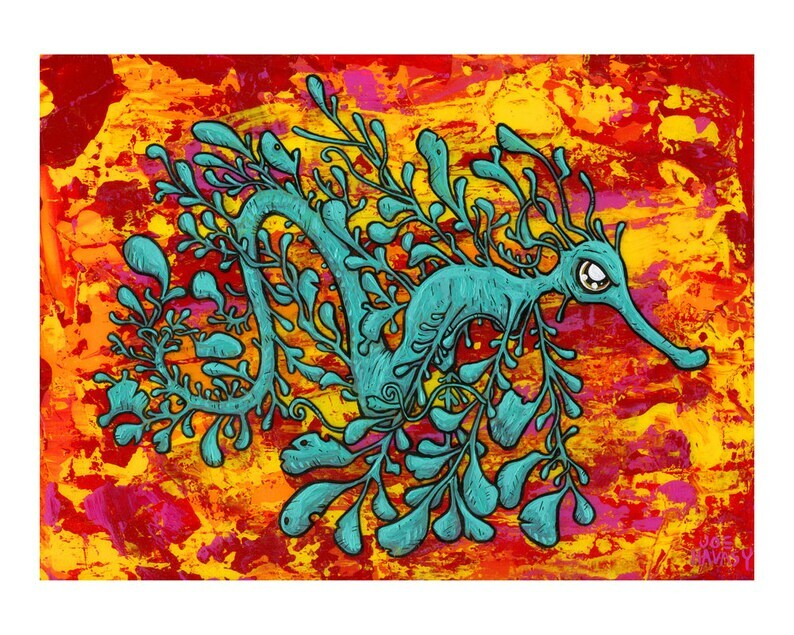 This is the second seadragon I've painted. He looks kinda tough, and I'm not sure why. The original painting was created using many different specialized techniques. This print is 8x10" on epson velvet archival paper and should last over 100 years. The actual image area is 6.6 x 9" on the 8x10" piece of paper. It ships flat between two pieces of cardboard, inside a weather resistant plastic envelope. The sticker is awesome, love it! This is just the cutest! I absolutely love it, it's a gift for a friend but I am so tempted to keep it! It is pretty big, which I like, but it's for a friends 28oz hydro flask so I am concerned it will take up a lot of space. But again it's just the greatest. The details are amazing and the colors are vibrant.